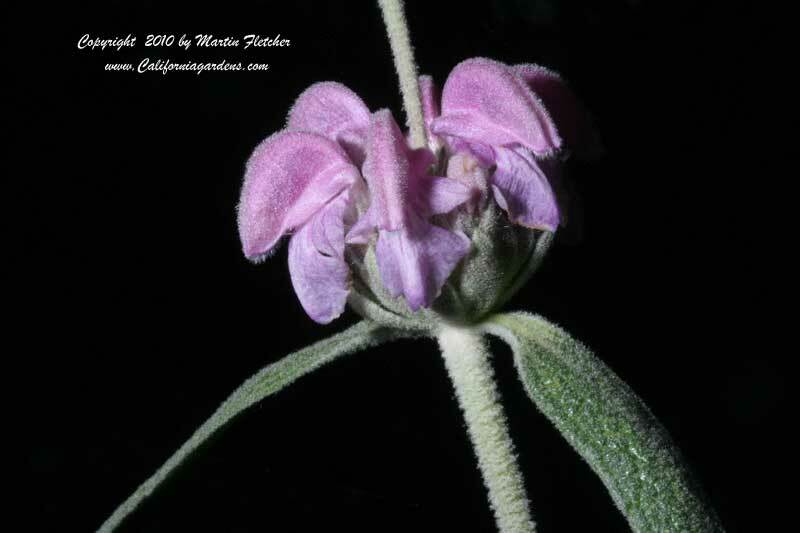 Phlomis purpurea has striking lavender flowers when in bloom. Phlomis purpurea blooms mid Spring through to Summer and sporadically reblooms until hard frost. Phlomis purpurea is quite drought tolerant. The Purple Jerusalem Sage tends to flop and breaks off easily so some support helps significantly. I often crowd Phlomis purpurea in with other shrubs to keep the Purple Jerusalem Sage upright. Stalks bloom once, new shoots appear near the base of the plant also helping to keep Phlomis purpurea upright or at least short enough not to flop so much. I cut the Purple Jerusalem Sage branches after they finish blooming. Phlomis purpurea prefers full sun, seems widely tolerant of soil types if there is adequate drainage and drying between irrigation cycles. Phlomis purpurea is marginally hardy into the low teens. Purple whorl of flowers of Phlomis purpurea - Purple Jerusalem Sage. High resolution photos are part of our garden image collection.